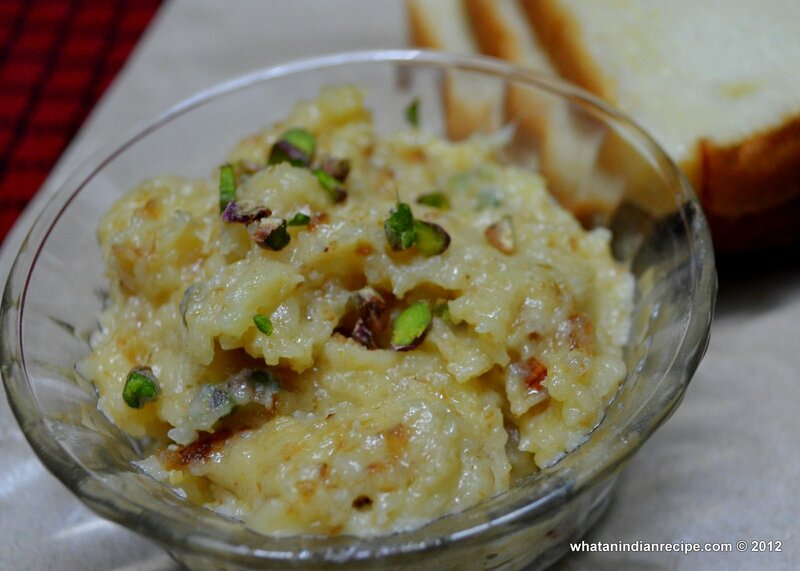 Bread Halwa is an easy to make and quite delicious dessert, generally made from leftover bread, with chopped almond & pistachios it brings out a unique taste, flavour & texture.Bread Halwa serves as a very good side dish for roti, paratha or puri, as many people love a sweet/dessert as an accompaniment. Slice the sides of each bread slice and then cut them in small pieces. Heat ghee in a pan and then fry the bread pieces till golden brown. Once the bread pieces are fried add sugar and milk and mix well. Allow the milk to boil and the sugar to dissolve completely. Once the milk starts leaving the sides add the almonds and pistachios and stir continuously till the halwa is done. Remove from fire and add a few drops of rose water and finally garnish with some more chopped almonds and pistachios.